Executing Makeflow script as a local condor job. Makeflow is a workflow engine that handles a large number of jobs. The following are characteristics of Makeflow. Master/Workers paradigm The master monitors and controls the workers while the workers complete the tasks. master monitors and controls the workers. Parallel job execution Jobs are executed in parallel as much as possible. Fault tolerant In case of failure, the jobs are continued from where they are stopped. UNIX tool Make The syntax of Makeflow is similar to the popular UNIX tool Make. The Make rules are convenient in describing the job dependencies. In this tutorial, we learn how to (1) use Makeflow and (2) detach the master process from the terminal. would print Fibonacci sequence 1, 2, 3, 5, and 8. 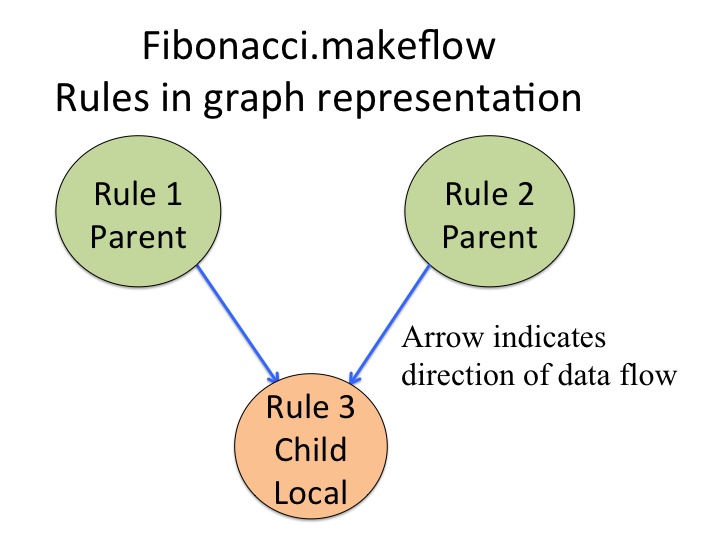 The figure shows the graphical representation of fibonacci.makeflow. It describes two independent jobs (Rules 1&2) followed by a dependent job (Rule 3). The syntax of the Makeflow file is based on Make rules. In the above description, there are three Make rules. Rules 1 and 2 execute fibonnaci.bash with input arguments 10 and 20, respectively. These two rules produce the output files fib.10.out and fib.20.out. Rules 1 and 2 are independent, so they would run concurrently. Rule 3 waits for completion of Rules 1&2. We may execute Makeflow either as an interactive process or a detached process. It is a good practice to run the master process in the detached mode rather than in an interactive mode. There are several ways to detach the master process from the terminal, such as SCREEN, tmux, and condor job as local universe. 1 job(s) submitted to cluster 367027. This shell command executes the makeflow file fibonacci.makeflow as a local condor job. 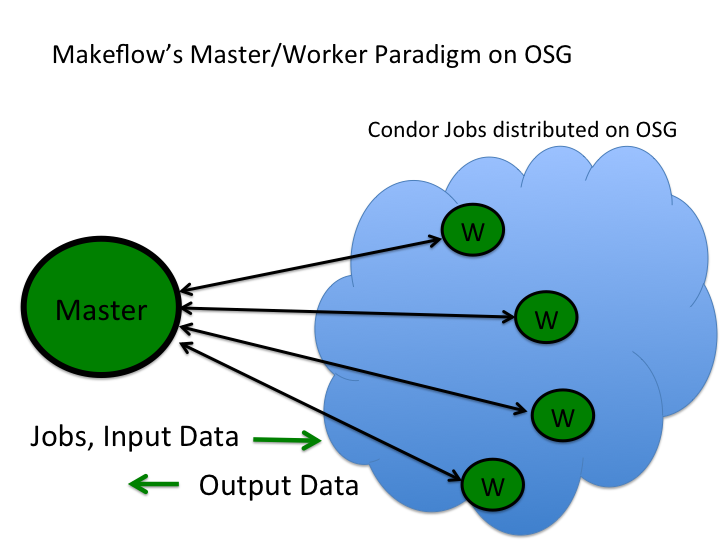 Further details on condor local jobs are given in the section Additional details on Makeflow execution: Interactive mode and detached mode at the end of this tutorial. The above output shows that the master is running and two workers are waiting in queue. The master process is a local condor job so it starts quickly. The worker jobs are distributed on OSG machines and they are waiting for resources. All jobs would complete in few minutes. This tutorial explains the basics of Makeflow on the OSG with a toy example of generating fibonacci sequence. Next, check the examples on makeflow-R and makeflow-GROMACS that show how to run real applications on the OSG with Makeflow. For technical questions about Makeflow, contact Cooperative Computing Lab (cclab). For general assistance or questions related to running the jobs on OSG, please email the OSG User Support team at user-support@opensciencegrid.org or visit the help desk and community forums. Makeflow runs in the interactive or detached mode. Interactive mode is is okay if the workflow finishes in few minutes. Often this is not the case. Therefore, it is a good practice to run the workflow in the detached mode. Starting execution of workflow: fibonacci.makeflow. The argument -T condor submits jobs to the condor batch system. The last line nothing left to do means the workflow is completed. To run fibonacci.makeflow in the detached mode on the OSG Connect, the condor local job is highly recommended. The other options are SCREEN, nohup, and tmux. Here, we provide details of the local condor job. The script submit_makeflow_to_local_condor.sh creates a file local_condor_makeflow.submit and submits the job with the command condor_submit local_condor_makeflow.submit. This is a job description file for HTCondor job schedular. The first line says that the job universe is local, so the job would run on the login node itself. The executable for the job is /usr/bin/makeflow with an argument -T condor fibonacci.makeflow. The keyword queue is the start button that submits the above three lines to the HTCondor batch system. This page was updated on Apr 23, 2019 at 11:45 from tutorials/tutorial-makeflow-quickstart/README.md.